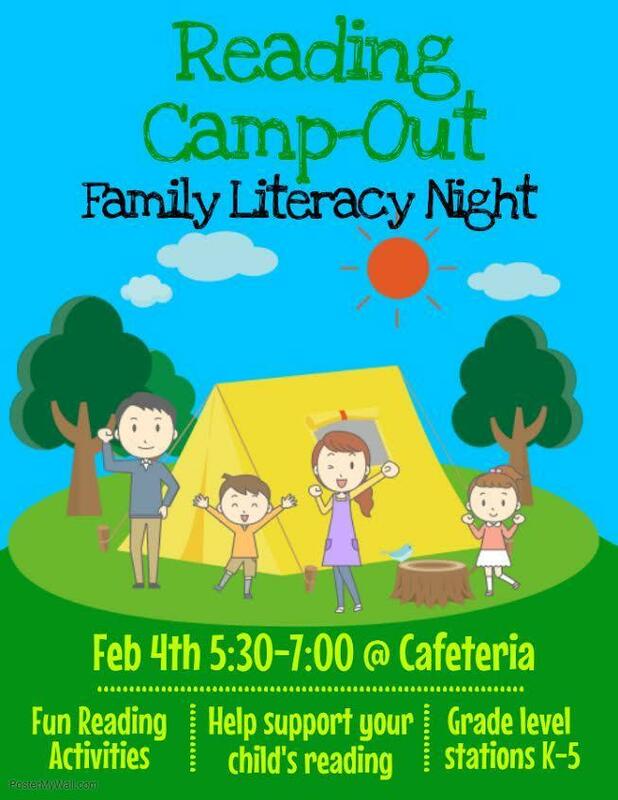 You are invited to our Reading Camp-Out Family Literacy Night! Please join us Monday, Feb 4th from 5:30-7:00 for a night of Reading! No camp out is complete without hot dogs, so be sure to bring $5 from 5:30-6:00 to join us for a Hot Dog Supper that includes a hot dog, chips, and a drink. We will enjoy stories by the campfire while we eat and get checked in. Beginning at 6:00, we will have grade level stations with activities to help support your child's reading. The stations are designed to rotate through in a designated timeframe, so make sure you are there the entire hour to get your cards punched to receive the goodie bag! Please see flyer for more details and schedule below. We look forward to seeing you all there!